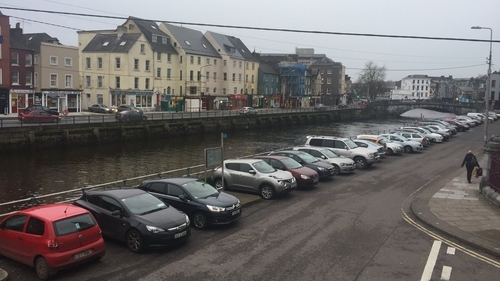 High tide has passed in Cork city without flooding although a flood warning remains in place for part of the city centre during tomorrow morning's high tide. The council says high tides and potentially high winds may cause flooding between 6am and 8am tomorrow morning on Morrison's Island, Union Quay, Wandesford Quay and Crosses Green. The council says it expects the main impact of any flooding will be on parking and on traffic. As the clean-up following Storm Eleanor continues, the National Emergency Co-ordination Group met this morning to review the situation. Group Chair Sean Hogan said it was also looking at helping people to deal with the situation in Galway, where parts of the city experienced severe flooding. Mr Hogan said they would examine the warnings that were issued following complaints in Galway that people were not sufficiently notified of flooding. He said there was an orange level weather warning from Met Éireann in place, which included a warning of coastal flooding and high tides. Mr Hogan said that while the storm had been anticipated, what may have taken people by surprise was the extent and speed of what happened in Galway. He said the direction of the high winds, with gales gusting to 130km/h during rush hour, along with the high tides had contributed to the flooding, which hit the city centre, Salthill, Oranmore and Clarinbridge. Some cars were abandoned in Oranmore as roads were blocked, while others in a car park in Salthill were partially submerged. Streets around the docks were flooded after high tides breached defences and inundated the areas around the Spanish Arch, Claddagh, Dominick Street, Quay Street and nearby streets. Water was more than 30cm deep in places. The coast road from the city to Oranmore was also impassable at rush hour as high tide combined with the strong winds to cause local flooding. Minister for Housing Eoghan Murphy said he expects the cost of the clean-up to be less than that for Storm Ophelia, which battered the country in October. He said adequate planning was in place ahead of Storm Eleanor, but all the vagaries of the weather cannot be predicted. ESB Networks have said that 2,000 homes, farms and businesses that lost power during Storm Eleanor still have no electricity supply. The storm brought winds of up to 155km/h in some areas. ESB Networks Operations Manager Derek Hynes said they are hopeful that everybody affected will have electricity restored by tonight. Speaking on RTÉ's Today with Sean O'Rourke, he added that those without power are predominately in the northwest. Around 10,000 customers were left without power in Mayo overnight. Other affected areas include parts of counties Galway, Sligo, Leitrim, Cavan and Monaghan. In total, 150,000 customers lost supply since the storm hit yesterday evening. ESB says that power has now been restored to 148,000 customers. Of the additional customers who lost power supply since this morning, due to lightning and high winds, 4,500 remain without power. ESB Networks says that all but small pockets of customers will have power restored this evening. A Status Yellow wind warning is in place from 3am tomorrow until 1pm for Munster, Carlow, Kilkenny, Wexford and Wicklow with west to southwest winds of up to 65km/h and gusts of up to 110km/h forecast. Gardaí are advising motorists to drive with extreme caution with reports of debris and fallen trees on many roads. The Minister of State for the Office of Public Works and Flood Relief, Kevin 'Boxer' Moran, said the Army had been deployed to help in the clean-up effort. In response to criticism from local people that they were not provided with an adequate flood warning from the local council, Mr Moran said there were lessons to be learnt for all local authorities. Speaking on RTÉ's Morning Ireland, he said: "I've been around the country over the last number of months and seen four major floodings ... and every local authority can learn in relation to what's happening. "I know that we have to sit down now and talk to the city and county managers … because if you look at what happened in Mountmellick or look what happened in Galway or in Donegal, we have to learn from this because these extreme weather events are happening far too often." Minister of State Paul Kehoe said a humanitarian flooding scheme was being set up to provide emergency assistance for small businesses, sports clubs and community organisations who had been unable to secure flood insurance and who have been affected by flooding. The scheme will be administered by the Irish Red Cross. The Department of Employment Affairs and Social Protections has said that it is available to provide assistance to householders affected by the storm. In a statement, it advised affected householders to contact their local Intreo Centre. The department said: "The Humanitarian Assistance Scheme is available to assist people whose homes are damaged by flooding and who are not in a position to meet costs for essential needs, household items and in some instances structural repair. "The scheme is means tested and assistance is not provided for losses which are covered by insurance or for commercial and business losses." National Emergency Committee will meet today to assess storm damage. Families in need of financial help due to storms should contact local Intreo office. Support for small businesses & community groups will also be available through Red Cross. Take care in high winds today. Parts of counties Antrim, Armagh and Tyrone were worst affected by the high winds and 110 km/h gusts which swept across Northern Ireland overnight. Up to 20,000 customers were without power for a time but Northern Ireland Electricity says the number this morning has gone down to 3,000 and emergency crews and engineers are working to reconnect those without power. The PSNI have appealed to motorists to drive with extra care after fallen trees and debris blocked some roads. A Met Office yellow warning for high winds remains in place across Northern Ireland until this evening. Elsewhere, the storm has cut power to 200,000 households in northern France and is set to move to other regions throughout the day. Households in the Normandy region were the worst hit by Storm Eleanor, while the area around Paris and northeastern Picardie and Champagne-Ardenne were also among those affected.